Have you heard the one about the clown, the mummy and the beer cellar? It’s just one of the fascinating anecdotes to be found in this in-depth look at the development of Egyptology in Greater Manchester. It may at first appear strange that the North West of England should be home to such a disproportionate array of important Egyptological collections, but the reason lies in cotton. Strong links were forged between the wealthy industrialists of “Cottonopolis” (Manchester) and the surrounding mill towns of Bolton, Rochdale and Ashton-under-Lyne, and the country that was the main source of their raw material – Egypt. 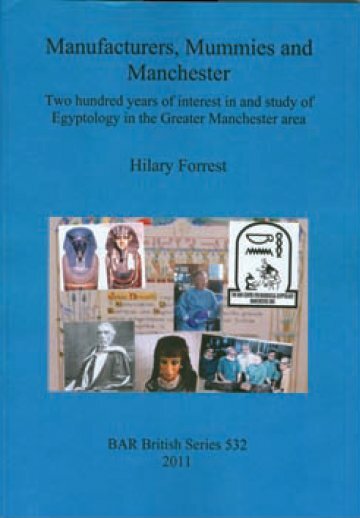 In the latest volume of British Archaeological Reports, Hilary Forrest traces the development of Egyptology in the North West, beginning with the wealthy industrialist collectors of the nineteenth century, and culminating with the setting up of the world renowned Manchester Egyptian Mummy Research Project in the 1970’s and the ground-breaking research of the KNH Centre for Biomedical Egyptology established in 2006. On the way, she gives a lively account of some of the key local characters and their exploits, including Jesse Haworth, who financed some of Petrie’s major excavations and whose collection forms the backbone of the Manchester Museum collection; and enthusiast Marianne Brocklehurst, friend and rival of Amelia Edwards in the race to collect and smuggle antiquities out of Egypt. In fact the development of Egyptology in the North West is remarkable for the number of outstandingly talented women who were involved, including: Kate Bradbury, companion to Amelia Edwards and wife of Frank Llewellyn Griffith, who was responsible for processing the material Petrie sent to Manchester; Annie Barlow, patron of the Chadwick Museum in Bolton, who entertained Mahatma Gandhi at her home, having to stand while he sat on the floor to eat; and Margaret Murray who carried out the first major multi-disciplinary mummy study and became the first female lecturer in Egyptology. Possible connections between ancient Egypt and the Bible attracted a number of prominent religious ministers to Egyptology. In Ashton-under-Lyne, there was a “fearful outbreak of Egyptology” that infected one minister called Norman de Garis Davis. His first trip to Egypt was with Petrie on Petrie’s honeymoon. The second part of the book looks at the development of a more scientific approach to the study of ancient Egypt, including the setting up in 1973 of a multi-disciplinary project, led by Rosalie David; its aim was to develop a methodology for the examination of mummies and to investigate disease, diet, daily life and funerary beliefs. The Manchester Protocol for non-destructive investigation of mummy material is now used by research centres around the world. The final part of the book is dedicated to the continuing work of the KNH Centre team, local societies, lecturers and enthusiasts, including the substantial contribution made to Egyptology in the North West (and beyond) by the late Bob Partridge, former Editor of ANCIENT EGYPT Magazine. 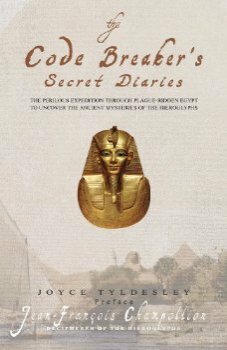 This is a nicely illustrated and well-researched account which will be enjoyed by anyone with an interest in Egyptology. Published by Archaeopress (British Archaeological Report No. 532), 2011. Warrington Museum and Art Gallery, one of the oldest public museums in the UK, has an Egyptology collection of around five hundred items, including an interesting selection of shabti figures. Most of these date to the Third Intermediate Period (c. 1069-747 BC) and a large number were excavated by Arthur Mace at Abydos Cemetery D in 1899-1900, part of a group that were distributed to several different museums across the UK and America. In this beautifully presented second volume in a series cataloguing shabti collections in the North West of England, the author presents a detailed catalogue of the seventy-two Warrington shabti figures, including figures made from wood, faience, pottery and stone, a rare New Kingdom bronze shabti, shabtis belonging to important nobles from the Late Period and one nineteenth-century forgery. Each figure is shown in a large colour photograph from front and back, with a short description, an information box giving its museum number, name and titles of the owner, date, material, size and provenance, its inscription, and a list of known ‘parallel’ shabtis in other museums. 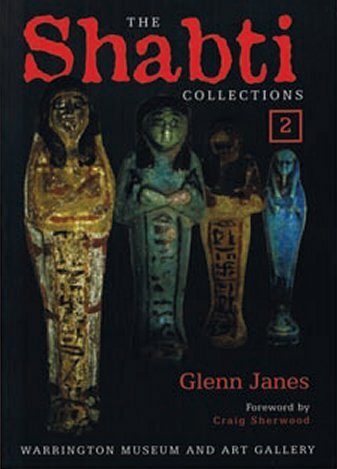 The book also includes a brief history of the museum from its opening in 1840, a note about the discovery of the shabtis and work done to trace some of the companion figures (parallels) in other museums, and an extensive bibliography. Published by Olicar House, 2011. When just sixteen years old, Jean- François Champollion announced to the Grenoble Society of Science that he was destined to decode the hieroglyphic script; on 14th September 1822, he finally cracked it after years of patient study, and promptly fainted in excitement at his brother’s feet. But it wasn’t until 1828 that the founding father of Egyptology first set foot in Egypt, spending sixteen months travelling to study inscriptions and to verify his conclusions. He kept a journal describing his adventures, and here you can read some of his diary entries, together with letters home to his brother. Dr. Tyldesley provides a scene-setting preface, with editorial notes and an afterword by Peter Clayton. There’s also an informative introduction by Richard Lebeau, explaining how Napoleon’s Egyptian campaign provided vital material for Champollion’s studies, and describing the discovery of the Rosetta Stone and the race to decode its inscription. But it’s the enthusiastic words of Champollion himself that make the best reading, describing his travels and discoveries and the dangers he met on the way. He writes about sleeping in an empty tomb and being less than impressed by the “pitiful Egyptian sculpture from the time of the Ptolemies”. He also records snippets of modern life at the time of his visit, including a religious feast where three hundred men chanted until they dropped with exhaustion and “white foam spouted on their beards”. Champollion himself often worked himself into the ground; he was found unconscious in tombs several times during his long stay in the Valley of the Kings. The strain of the trip took its toll on Champollion’s health, and he died just a few years later, in 1832 at the age of forty-one. Published by Gibson Square Books Ltd. 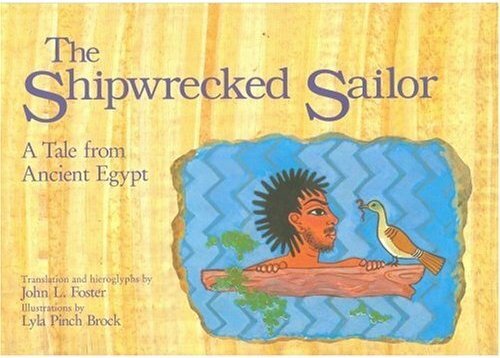 The Shipwrecked Sailor is one of the best known tales dating to the Twelfth Dynasty of the Middle Kingdom (c. 1985-1795 BC), and makes an ideal fairy tale for children. The story follows the adventures of a sailor who survives shipwreck to find himself on an enchanted island, face-to-face with a huge talking snake with a long beard. He is at first afraid, but the snake treats him well, and he is eventually rescued by another ship. This edition of the story, translated by John L Foster, is presented as a poem and is beautifully illustrated by Lyla Pinch Brock, who based most of the drawings on actual tomb scenes. But the book is much more than an illustrated children’s story: it contains information about the original text (the only surviving copy is a papyrus held in the Hermitage Museum in St. Petersburg), the context of the story (as part of a larger work now lost), a glossary, a short bibliography and a note about the sources for the illustrations and how they were adapted. Students of languages will find the detailed explanation of how the work was translated particularly interesting. Taking the first four lines of the poem, the author shows how the original hieratic text is first transcribed into hieroglyphs and transliterated. The next step is a literal translation of the words and phrases into English, attempting to be faithful to the exact words and word order. The final stage is the ‘literary translation’, where the translator transforms the text into a version that flows well and is easy for the modern reader to follow, while remaining true to the original ancient Egyptian writing as far as is possible. The poem is then presented alongside the hieroglyphic version so you can practice translating the story for yourself ! The aim of the book, according to the author, is to interest young people in the study of ancient Egyptian language, literature and history, but I’m sure ‘young people’ of all ages will enjoy this well presented tale of magic and adventure. Lucie Duff Gordon, “Lady Buff ” as she was known, was admired by Victorian London for her beauty, her intellect, and her unpredictable dress sense. Happily married to Sir Alexander Duff Gordon, she smoked a cigar and drank port with the men. She inspired Tennyson to write The Princess, and Thackeray said she should write her own books. But in 1862, Lucie was diagnosed with tuberculosis and on the advice of her doctor, she left her husband and three children and moved to Luxor, where she began a new life, discovering “the real true Arabian Nights”. Drawing on the letters Lucie wrote home to her husband and mother from Egypt and an earlier stay in South Africa, the author relates Lucie’s story from her early childhood in London, her marriage at the age of nineteen, and her Bohemian life socialising with the Victorian literati, to her transformation in Egypt, where she immersed herself in Egyptian culture, turned her back on the English community in Cairo, and became Noor ala Noor: ‘Light from the source of all light’. In her letters she painted a vivid picture of Eastern life, religion and customs, and related many personal stories about the people around her. Frank’s book is a well researched and absorbing biography of an unconventional woman who was never afraid to break with the conventions of her time. Published by Tauris Parke, 2007. In the first of a new series rediscovering classic Egyptology texts, Joyce Tyldesley pays homage to a Scottish preacher who inspired her interest in Egypt’s most famous heretic. James Baikie (1866-1931) is, in my view, one of the unsung heroes of Egyptology. Not because he conducted extensive excavations or made spectacular finds. 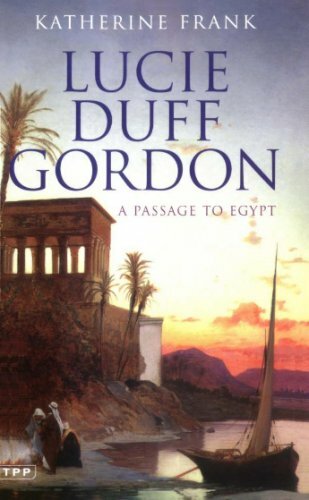 Quite the reverse: he was an Oxford educated Scottish minister who never actually visited the land of the pharaohs. He was perhaps the first ‘armchair Egyptologist’. But, from the security of his Torphichen manse, he wrote a series of historically accurate books that introduced the general public to the glories of the dynastic age. Included amongst his many publications are The Story of the Pharaohs, A Century of Excavations in the Land of the Pharaohs, and The Life of the Ancient East. These books are as fresh and interesting today as they must have been to their original readers. They are available in cheap reprints, and in many cases free copies can be downloaded from the internet, but I would recommend trying to source an original version from a second-hand bookseller. The feel of the thick paper combines with the slightly musty smell of the old books to make reading them a real pleasure. The Amarna Age is a particularly informative volume. Published in 1926, not long after the discovery of Tutankhamun’s tomb, and before that tomb had been fully emptied, it allows modern readers an understanding of the state of knowledge of the Amarna Period at that time. This is important. Anyone who hopes to unravel the complexities of what is still one of Egypt’s most confusing periods needs to understand the thoughts of the first ‘authorities’ on this subject, as their views have had a deep influence on all subsequent work. 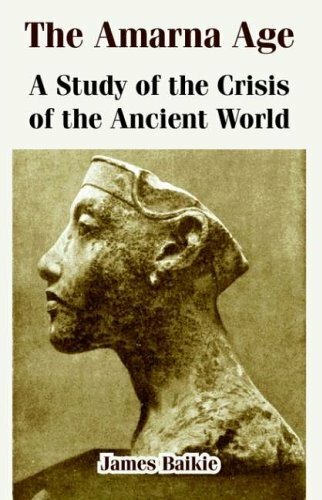 Modern books on the Amarna Period tend to focus very intently on events at Amarna and Thebes, their authors perhaps thinking that this is more than enough information for their readers to deal with. Baikie, in contrast, does not have access to the most recent research, and so takes a far wider view, setting Egypt’s ‘religious revolution’ against its Eighteenth Dynasty backdrop and Near Eastern background. To aid his readers, he provides amazingly detailed fold-out maps. Queen Tiy is (rightly) allowed a prominent role in the tale; the alluring Nefertiti (his description) less so. A. & C. Black Limited, London, 1926. Dr. Joyce Tyldesley is Senior Lecturer in Egyptology at the KNH Centre for Egyptology, Manchester University. Her most recent book, Myths and Legends of Ancient Egypt (Penguin) will be published in paperback in August 2011. I understand that Joyce, who is a long-term resident of Bolton, has recently been awarded an honorary degree by Bolton University in recognition of her contribution to Egyptology. I’m sure that all our readers will wish to join with me in congratulating Joyce on this well-deserved award.